MetaLocator allows you to manage coupons and promotions (collectively called "Offers") on a per-location basis. You can include offers directly in the locator search results and include a banner-ad-style image and a link to an external landing page describing the details of your coupon. The MetaLocator Offer system is available as an optional Add-On. 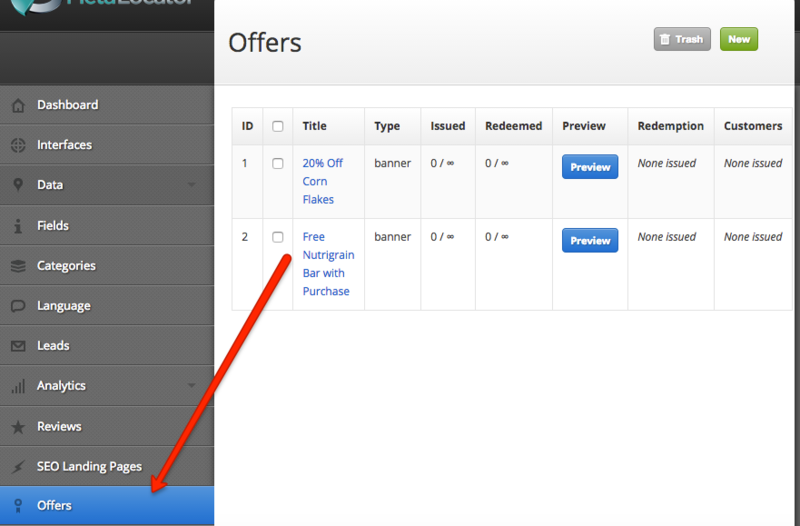 To create a new offer, click Offers on the main Dashboard menu. To create a new offer, click New in the upper right. The first options shown above are the most important. Provide a Title, Link and Image for your offer. 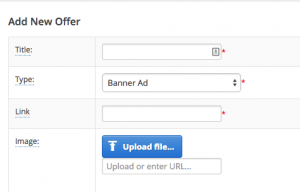 Once you have provided a title, link and image for your offer, save the offer using the Save button in the upper right. The Banner Ad offer type allows you to display offers directly in your search results. Additionally, it allows you to display a link to Offers available at that location. If there are more than two offers at a location, the system will display a link to all of the offers at that location to avoid crowding the search results. 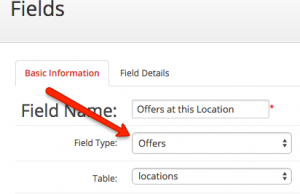 To associate an offer with a location, click Data > All Records. Similar to assigning categories, you can bulk-assign offers to locations by selecting the row with the checkbox on the left of the row, or creating a bulk selection. Once the selection is established, choose "Set Offers" from the Bulk Actions menu in the upper right. You will see the offer is attached to the location directly in the All Records screen as shown below. 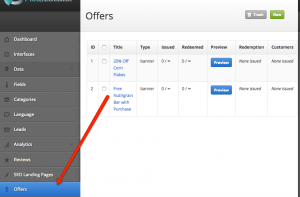 To control where the offer is displayed, create a new field for the offers and add it to the Item Template. To create the field, click Fields, then New. In this example, we added the new Offer field to the Map Popup Item Template, and it appears thusly in the map popup window as shown below. The image links to the link provided. That link can be a page you create that includes more detail about the offer.